Sometimes I buy things impulsively and if my husband were saying this he would replace “sometimes” with “all the time”. My one such find was cracked wheat at the neighborhood Patel brother store. I thought maybe one day I could make Lapsi (a Gujarati dish made from frying cracked wheat in ghee and adding sugar and cardamom) for breakfast for my little ones. So I bought it and it lay in my pantry for a month waiting for my attention. Every couple of months or so, I clean up my pantry and when I did, I found this packet of Cracked Wheat or Fada and decided to make Cracked Wheat Payasam – a dish I have been dreaming of ever since Ganpati festivities started. I remember first having it when during the Ganapati Celebrations in our building, some aunty had made the Cracked Wheat Payasam as an offering to Lord Ganesha. The Payasam was later distributed later to the baccha party (kids) and the uncle and aunties in the building. Here’s my version of this recipe. Enjoy it as a dessert or for breakfast like I did. Pressure cook the cracked wheat in 2 cups of water on medium heat with a closed vent. Let the vent go off 3 times and then switch off the gas. Once the cooker cools down, open the lid and add jaggery and stir. Turn the gas on medium heat and allow the jaggery to melt before adding the coconut milk. Let the coconut milk boil for approximately 5-6 minutes and then add milk and cardamom powder and stir it well. Reduce heat to a simmer. Meanwhile, in a separate pan, heat a tablespoon of ghee on medium heat, fry cashews till they are golden brown, add raisins and once the raisins double in size. 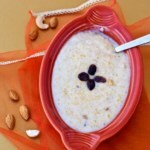 Add the nuts and raisins to cracked wheat payasam and mix well. Take it off heat and serve hot. 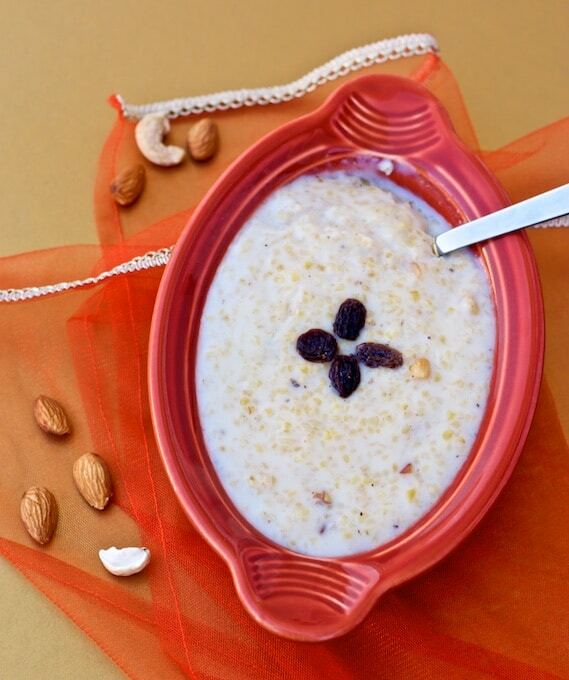 hi Anu, have you tried the CRACKED WHEAT PAYASAM in slow cooker? Can you share the process? Hi Jismy! I haven’t tried it yet in the slow cooker. I haven’t had great luck with slow cooking when it comes to beans and grains.You could always pressure cook the cracked wheat and simmer it in the slow cooker but I am assuming you are looking for a recipe that completely uses the slow cooker. My plan is to leverage the slow cooker more starting next year. I will make a note to drop you an email, if I was able to make this recipe completely using slow cooker.